I love this place. Beautiful Place. Won Grocery Bingo my 1st time playing and had so much fun. Employees are amazing and very friendly. I would recommend this place to anyone. Absolutly love being here. Can't wait till the pool opens up. Very fast and courteous. maintainance when we had a problem. Really enjoyed the volleynall that went on this weekend. Awesome area to live!!! Close to school and few fast food area. The buses run here, to Walmart, school and the mall which is awesome! Pet friendly too which is good. everything is great just wish the flooring would be updated (carpet). would also like for the pool to be opened up earlier. other than that everything’s been great! The staff was extremely nice and was always there in case we needed anything or had any questions. If they didn't know an answer to our question they would make sure to find someone that did. Apartments are decent, the staff is friendly. I do wish the furniture and overall look of the apartments were updated though. Also, maintenance is good! The only thing i don't like is the small space, but i knew that when i walked in. Other than that i think it was a perfect choice for my first home (away from home). Fantastic, I feel safe and comfortable with my roommates. I haven't had any conflicts with neighbors, in fact the people above us often hangout with us now. It is very clean and I love living here. I know so many people around me and so many furry friends to see when you walk outside. The staff is wonderful and very cooperative. Thank you Alexandra, for your great review! We love seeing all the cute pets around here as well! Please let us know if we ever fall short of your expectations! Quiet community. Everyone is really nice here. Great amenities and extremely convenient location to school and grocery stores. I highly recommend living here. Thank you for your awesome review Caroline! If we every fall short, please do not hesitate to let us know! Hi Tina, thank you for your kind review. If the noise from you neighbors is ever excessive, please contact the office at (940) 692-0831. Thank you. Looks really nice...only big complaint so far is that I had to clean the bathroom pretty good and also clean all the cobwebs that were sitting around! Otherwise it’s pretty nice! Hi Seth, thank you for your review. We apologize for any short comings on your move in. We would be happy to rectify any issue immediately. I will contacting you today in order to make sure everything is up to standards in your unit. Thank you. Mustang Village is a great complex filled with amazing staff, beautiful pool, affordable rent and a good clean and and quiet environment. I would highly recommend staying here. Hi Sally, Thank you for your kind review. If you ever need anything please contact us at (940) 692-0831. Thank you. Hi Deshaunte, thank you for your kind review. You have been a great resident and we look forward to continue in providing you great service and a great place to live. Thank you again. Hi Rianne, thank you for your review. 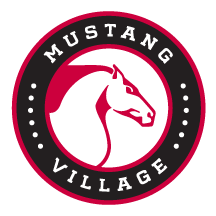 We are happy that you are comfortable at Mustang Village. We will continue to keep our grounds clean everyday and manage our residents with pets. Mustang village is a really nice place to live. the community is very quite throughout the day time. the maintenance team work extremely hard to ensure that the ground is kept clean. Hi Tazyika, thank you for your kind words. You have been a great resident and we will continue in providing you great service and a great place to live. Hi Durell, thank you for your review. We are happy to hear that your stay so far has been pleasant. If noise levels ever get excessive please contact the office at (940) 692-0831 and will we handle the issue immediately. Very quiet and low-key environment. Great place to live with great benefits! It is also very welcoming, and the staff is so polite and kind. Hi Arthlene, thank you for your review. You have been a great resident and we will continue to strive to make your living experience exemplary. Hello Morgan, thank you for your review! We really appreciate the feedback! We would like to stop the owners who are not picking up after their pets and we could use your help! If you ever see anyone not picking up after their pet please notify us! Again, thank you for your review and we look forward to hearing from you! The staff are always super helpful and understanding. I moved here in December and I feel more welcomed here than my last apartment. And the community environment here is a huge plus! Hi Breana, thank you for your review. You have already been a great resident in short amount of time you have been here. We look forward to making your stay at Mustang Village exemplary. Good Place to live, very spacious, comfortable and has lots of amenities. Maintenance is good. The overall apartment complex is a nice place.